It’s been shown that first impressions matter a lot more than we think, and professional concrete cleaning can help with that. That’s not just true for people – it applies to buildings, too. If your business operates out of an ugly, stained, concrete building, it’s hard for you to build a positive brand image. It doesn’t matter how great your company is – people will always remember your unsightly, neglected premises. Luckily, it’s easy to arrange professional concrete cleaning and give your building a whole new lease of life. Want to learn about the key benefits of getting your concrete professionally cleaned? Concrete gets stained over time, no matter what you do. Stains can be caused by natural elements, like the weather, pollution from traffic, spillages, and leaks. Sweeping or spraying with a hose might remove small amounts of surface dirt, but it won’t touch the stains that go deeper – these need to be removed by a pro. Arranging professional cleaning will remove even the oldest, most-ingrained stains, making your location look brand new. Exposure to mold can have a variety of negative health consequences, from wheezing to skin irritation. It also looks pretty bad. Mold is more likely to form in areas of high moisture, and it normally shows up as a thick green or black film – gross. Luckily, professional cleaning will remove 100% of the mold plaguing your concrete, without using harsh chemicals that could damage nearby plants. Your building will look better and be healthier to spend time around – it’s a win-win. Is there anything more annoying than chewing gum that’s been trodden into your concrete by millions of footsteps? 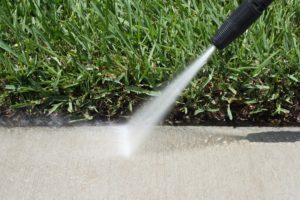 Concrete cleaning is the best way to remove ugly chewing gum stains, either by scrubbing manually, using a high-powered pressure washer, or applying chemicals. Now you just need to stop people from dropping gum again… invest in a waste bin for high foot traffic areas. If you’re planning to sell your building, you want it to look as modern and well-maintained as possible. Professional cleaning can easily take years off the age of a building, making it look less like an old wreck and more like a tempting investment opportunity. Cleaned concrete looks lighter in appearance, doesn’t have patches of discoloration, and isn’t stained. This gives the impression that the building has been well cared for and will be in good condition overall. Don’t let the appearance of your concrete drag down the rest of your building – especially if you’re hoping to sell. Why Arrange Professional Concrete Cleaning? Still not convinced that you should invest in concrete cleaning? Clean concrete makes a better first impression for visitors, removes unsightly stains and mold patches, and makes your building healthier for users. On top of that, cleaner concrete can make your building look much younger. Whether you want to win more clients, make your business more appealing to potential employees, or even sell your property, concrete cleaning can help. For more information on keeping all your properties in great shape, check out our blog.